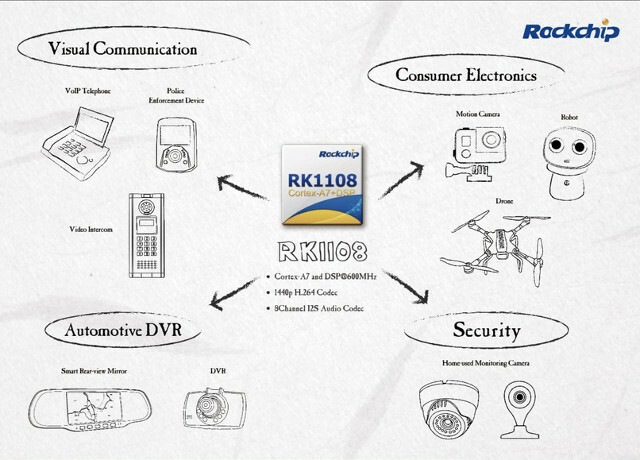 Rockchip has introduced RV1108 ARM Cortex A7 SoC with a 600 MHz DSP targeting visual communication, consumer electronics, automotive DVR, and security applications thanks to its 8-channel I2S audio codec and 1440p H.264 video encoder and decoder. eMMC Interface – Compatible with standard iNAND interface, eMMC 4.51 standard. 4-lane MIPI DSI interface up to 720p @ 60fps. Codec – 24-bit DAC with Line-out, up to 96 KHz sampling rate, mono, stereo, and 5.1 audio support. There’s no much more information at this stage, and beside the evaluation board shown above, I could not find devices based on Rockchip RV1108 processor yet. Some code has been pushed to GeekboxZone Linux kernel repo in Github. The company also unveiled Rockchip PX5 octa-core Cortex A53 processor for automotive applications with support for ADAS algorithms, and 4K60 video decoding, but there’s even less information than for RV1108 so far. …why is the camera pointing on his crown-jewelry?